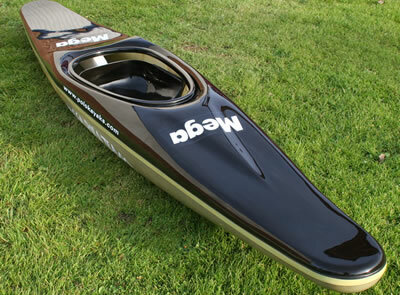 Because this boat has been design for a smaller / lighter paddler, it's not only highly maneuverable, but is fast too. So, what about the turning side of things... Deep pivot turns are usually the only other way most paddlers decide whether or not they like a boat, and that being the case, they'll not be disappointed with the Evolution. With reduce "winged" edges the paddler is no longer limited to rely on the kayak for support, but their own ability to maintain extended balance. The reduction in length makes the Evolution turn exceptionally fast allowing the paddler to control the front as well as the rear of the kayak for more skillful kayak tackles and marking. Furthermore, since the kayak has effortless handling, the ease of losing a marker now makes the smaller paddlers in a team much more competitive than ever before, even against their larger counterparts. Since the Evolution is smaller compared to any other existing polo kayak in nearly every dimension, the overall weight is also small. For the standard Carbon/Kevlar construction, the Evolution is usually around the 7.5Kg mark even when fitted with full length foam, seat and foot rests.